What can tear and destroy a small rural community and a family apart more so than a tragedy? At the very heart of The Mourning Hours is the story of the unraveling of the Hammarstrom family and their tranquil secure life stolen from them. I absolutely could not pull myself out of this book! I was so completely absorbed right away due to the magnificent writing style of the author. I was immediately drawn and captivated by the way she wove the story together and the delicately dropping of hints foreshadowing an impending maelstrom of events. Exquisitely written and a story that will stay with me a long time. Let’s just say by the end, I was brought to tears…. 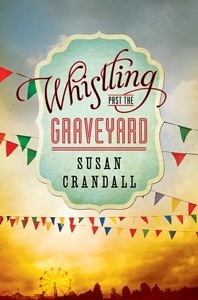 Marianslibrary Review of WHISTLING PAST THE GRAVEYARD! You’ll learn a world of insight from 9-year-old Starla! 1963, deep in the state of Mississippi, lives young Starla, along with her grandmother, Mamie. Starla’s Daddy works on an oil rig and her Momma, Lulu, left several years ago to become a famous singer in Nashville. Mamie runs a pretty tight ship, too rigid for this little redheaded spitfire. One afternoon, Starla, after an altercation with an adult, thinks she’ll end up in reform school. Off Starla goes — on a journey to her Momma in Nashville where she’ll find solace & a new life. It’s the journey of her lifetime as she meets Eula & discovers a world where the color of your skin really makes a difference. You will be rooting for Starla all the way with each twist in the road. You’ll laugh at her take on life situations and most definitely cry at the cruelties & injustices Eula & Starla experience. Starla learns important life lessons — especially the good in herself. You’ll learn SO much yourself from Starla….